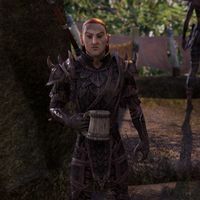 Captain Odreth is a Bosmer in charge of the Vinedusk Rangers found at their headquarters in Reaper's March. Oath of Excision: Help the Vinedusk Rangers repel the '"`UNIQ7193ccb662a87199-cleanspace-000001D7-QINU`"'Colovian invaders. This page was last modified on 30 April 2017, at 22:23.